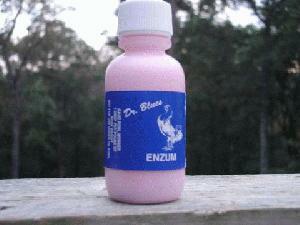 enzum 1oz bottle For all species of worms common to Gamefowl. Tape, Gut, Intestinal, Round, Gape, ETC. A new Broad-spectrum wormer that is exceptionally effective in the removal and controlof all species of worms commonly found in gamefowl. Enzum is safe, effective and easy to use. This wormer kills more species of worms at different development stages than any other wormer.